Falvey Memorial Library :: Need Help? "Finding Augustine in Falvey"
Need Help? "Finding Augustine in Falvey"
A fourth-century saint, a Catholic bishop of the North African city of Hippo, a Doctor of the Church, a biblical exegete, a philosophical thinker, an early Church Father and a writer of some of the most influential books in the history of Western civilization: Augustine is one person about whom every student at Villanova University, a Catholic and Augustinian community, will learn. But when students need to do library research on Saint Augustine of Hippo, where do they begin? Question: How do I begin library research into Augustine? Answer: You may want to contact the subject librarian for Theology and Religious Studies, Darren Poley. His office is Falvey 234, phone 610-519-6371 or email darren.poley@villanova.edu. Another first step is to think about what you are seeking. Are you looking for the writings of Saint Augustine in Latin or an English translation? Do you want books and articles about Augustine written by scholars? Do you just want to look up a short, authoritative reference article on an Augustine-related topic? Is your research centered on something specific to his life or place in history (Augustine as a Christian philosopher, for example)? Question: Where can I find the writings of Saint Augustine in Latin or in English translation? Answer: Augustine’s original writings, which are in Latin, can be read in print or online. The Corpus Christianorum Series Latina and the Corpus scriptorum ecclesiasticorum Latinorum (CSEL) are series with critical editions of Latin texts. The “Patrologia Latina” series edited by Jacques-Paul Migne, which includes Augustine’s Latin works, is available in print (Falvey West stacks) and online. Advanced researchers looking for an authoritative database of Augustine’s works in Latin should investigate the Corpus Augustinianum Gissense (CAG 2). The Past Masters database has most of his works that have been translated into English, as well as the complete works in Latin. The works in English in Past Masters are from the best series of translations in print: The works of Saint Augustine, a translation for the 21st century. Since most students are looking for English-language resources, Writings of Saint Augustine and the Ancient Christian Writers series are other good English translations of Augustine’s major works. Question: How do I discover books and articles about Augustine written by scholars? Another great place to look is the WorldCat (OCLC) database. Search results in this database will include many items Falvey doesn’t have in its collection but which you can get through Interlibrary Loan (ILLIAD). 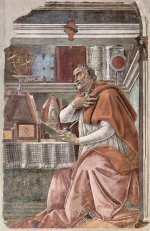 In-depth researchers will find Finding Augustine, a free Web-based bibliographic database, helpful in identifying works of Augustine-related scholarship. For scholarly articles about Augustine, any of the following databases provides an effective starting point: Philosophy Documentation Center Collection, Project Muse, and/or JSTOR. The ATLA Religion Database and Catholic Periodical and Literature Index bibliographic databases are also worth searching although they do require you to use the “find it” button to locate an article’s full text. Question: How do I look up a short authoritative reference article on an Augustine-related topic? Answer: The best one-volume encyclopedic reference book, Augustine Through the Ages, is in multiple locations in Falvey, including full-text in the Villanova University Digital Library. Excellent articles are also easily discovered by searching for “Augustine” or related subject terms in e-reference books for Religion & Philosophy. The New Catholic Encyclopedia (2nd ed.) and the Encyclopedia of Religion (2nd ed.) are also available as multi-volume print reference books, shelved in the non-circulating reference collection on Falvey’s second floor. Question: If my research is centered on something specific to his life or place in history (Augustine as a Christian philosopher, for example), what do I do? Answer: To narrow your topic, simply develop a list of descriptive words that suit the particular dimension of Augustine research in which you are interested. But just piling on the descriptors can also muddle things quickly. Begin by brainstorming the key words or concepts related to the specific subject you want, and then writing them down. When searching for books in the library catalog, knowing some subject terms in advance helps. For Augustine, “History of doctrines,” “Theology,” or “Biography” are good general subheadings or “Topics,” that appear in the list of facets on the right of the search results page, after a search for “Augustine” as Subject. Also adding “Saint, Bishop of Hippo” to his name will make your search more specific to the Saint Augustine we are referring to. If you want scholarly journal articles from an academic discipline (philosophy journals, for example), you will want to search a subject-specific database such as Philosophers Index, listed on the Philosophy subject guide, or databases alphabetically by title: A-Z list of databases.